This Freescale StarterTRAK board is based on the SKEAZN64MLH2 which is a 40MHz device from the ultra-reliable EA automotive microcontroller family with Cortex-M0+ core. This KEA64 device has 64k Flash and 4k SRAM and is in a 64 pin LQFP package, whereby the KEA64 is also available also in 32 pin LQFP and its memory ranges from 32k..64k Flash and 2k..4k SRAM. There is no crystal on the board so the internal 31.25kHz RC oscillator and FLL are used to generate 32MHz system and 16MHz bus/flash clocks. uTaskerSerialBoot_TRK-KEA64_KBOOT_UART.bin KBOOT compatible UART loader [7.9k] allowing applications to be loaded at link address 0x2800. When operating, the first blue LED blinks at 5Hz. To force the loader reset the board with the push button SW1 held down. To disable the watchdog reset the board with the push button SW2 held down. This can be loaded using the TRK-KEA64's USB-MSD (OpenSDA) boot loader. Note that the loader limits application sizes to 40k - it can be built without limits using the µTasker project. uTaskerV1.4.10_BM_TRK-KEA64_2800.bin KEA64 application with command-line menu on the virtual COM connection (115'220 Baud). Connector pins J3-4 and J7-6 are configured as KBI interrupts (falling edge sensitive) and there is a message on the UART output on each edge. Low power modes can be set in the application menu and the processor runs at 32MHz [20k]. Linked to 0x2800, it can be loaded using the KBOOT PC tool. When the application is running the first blue LED blinks at 2.5Hz (the second blue LED indicates the amount of time the device is not in a low power mode during the operation). 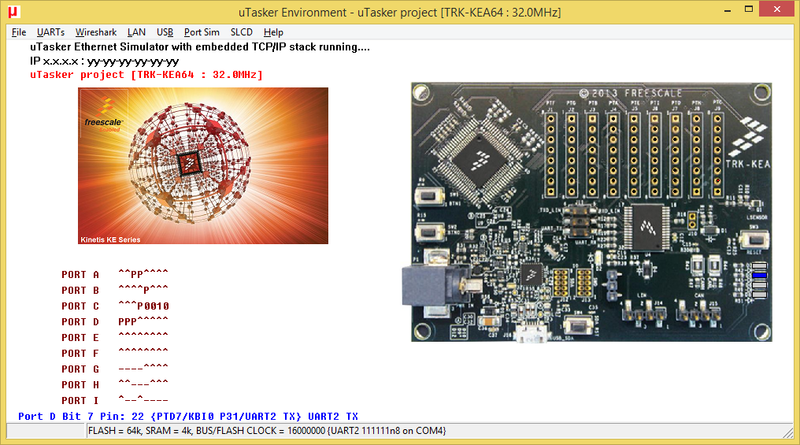 uTaskerV1.4.10_TRK-KEA64.bin The same KEA64 application as stand-alone software that can be loaded using the TRK-KEA64's USB-MSD boot loader [21k]. uTaskerSerialBoot_TRK-KEA64_SREC_UART_38400.bin SREC UART loader [7.7k] allowing applications to be loaded at link address 0x2800. When operating, the first blue LED blinks at 5Hz. To force the loader reset the board with the push button SW1 held down. To disable the watchdog reset the board with the push button SW2 held down. The Baud rate of the UART (on the OpenSDA virtual COM port connection) is 38.4k. This can be loaded using the TRK-KEA64's USB-MSD (OpenSDA) boot loader. Note that the loader limits application sizes to 40k - it can be built without limits using the µTasker project. uTaskerV1.4.10_BM_TRK-KEA64_2800.SREC KEA64 application with command-line menu on the virtual COM connection (at 38.4kBaud) [51.2k]. Linked to 0x2800, it can be loaded using the SREC loader. When the application is running the first blue LED blinks at 2.5Hz.